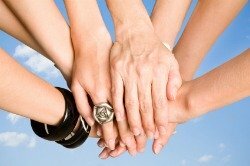 Fibromyalgia support groups can be a crucial part of your recovery process. They can connect you with a variety of people that have gone through the same difficult journey. Many of these people have experienced the same debilitating symptoms, and have felt the same frustrations while living with this disorder. They can also provide you with valuable tips and tricks to help you avoid pitfalls when it comes to treatment options. Support groups are located online through fibromyalgia chat rooms or forums, or they can even be formed offline in cities nearby. Some are held at local churches or schools and others may be held at someone’s home. There are many different resources to tap into when it comes to finding people to share your ideas and experiences with. It can be a very rewarding experience. I've met some extraordinary people over the last 20 years and find that most are willing to go out of their way to help you find comfort and strength during these challenging times. Sometimes it's very difficult to explain to family members and loved ones the painful and bizarre symptoms you're experiencing. But when you connect with someone that understands exactly what you are going through, it can be very comforting. Here are some resources that me and my friends have learned to love. "What your doctor may not tell you about fibromyalgia". It contains vast amounts of articles and discussions ranging from guaifenesin treatment, symptoms, salicylate free products, research, and hypoglycemia diet recipes. It's one of the most valuable fibromyalgia message boards you have at your disposal when using the guaifenesin protocol. Yahoo groups have fibromyalgia chat rooms that are extremely helpful. They are very welcoming, and have many members that are willing to listen and share their thoughts and experiences. The website ukfibromyalgia.com has one of the best fibromyalgia support groups for people living in the United Kingdom or other surrounding countries. It has over 5000 users and also contains a doctor's directory to help you find a physician or specialist near you. A great website menwithfibro.com is one of the best fibromyalgia support groups for men I've seen over the years. They've created a great platform for men to share their input and concerns. The smallest percentage of people with fibromyalgia are men, so many find it hard to find resources where they can talk to others coping with fibromyalgia. Look no further. Regardless of what treatment option you choose, fibromyalgia support groups can be an added benefit to helping you tackle fibromyalgia. They can save you a significant amount of time and lead you to a more productive and successful recovery. Copyright © 2011-2012 Fibromyalgia-Treatment-Options.com All Rights Reserved The information provided herein should not be used for diagnosis or treatment of any medical condition. A licensed physician should be consulted for diagnosis and treatment of any and all medical conditions. Please consult your healthcare provider with any questions or concerns you may have regarding your condition.